Vaughan, Ont. – April 6, 2018 – UFCW Canada Local 1006A members working at LensCrafters have ratified a new union contract with improvements to their rights at work. The two-year agreement runs until March 2020 and covers 75 members at four different locations. “The members and bargaining committee at LensCrafters showed tremendous persistence, solidarity, and strength in coming together to achieve this union contract for a better future,” says UFCW Canada Local 1006A President Wayne Hanley. “As the leading union for workers in Ontario’s optical industry, we are proud to do our part to achieve improvements and make a difference in the lives of members,” he adds. 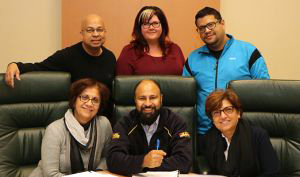 Bargaining was led by UFCW 1006A Central Region Coordinator Jonathan Lobo, with support from Union Representative Petra Niebergall and union members Ian Curtis, Vikram Datt, Mansooreh Mortazavi, and Parvin Vahidi. New severance language that provides 2 weeks for every year of service. “I’m very proud of our bargaining committee’s hard work, and I want to thank all of the members for their support and participation during the negotiation process,” says Lobo.